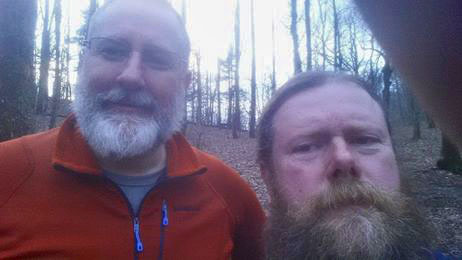 Rev Kane (the hairy one) and my friend Jim Cooper who met me at the Hike Inn and hiked me into the AT on my first day last year. So last year at this time I was in my first week on the Appalachian Trail. It was an amazing time, here are my journal notes from that first day on the trail. 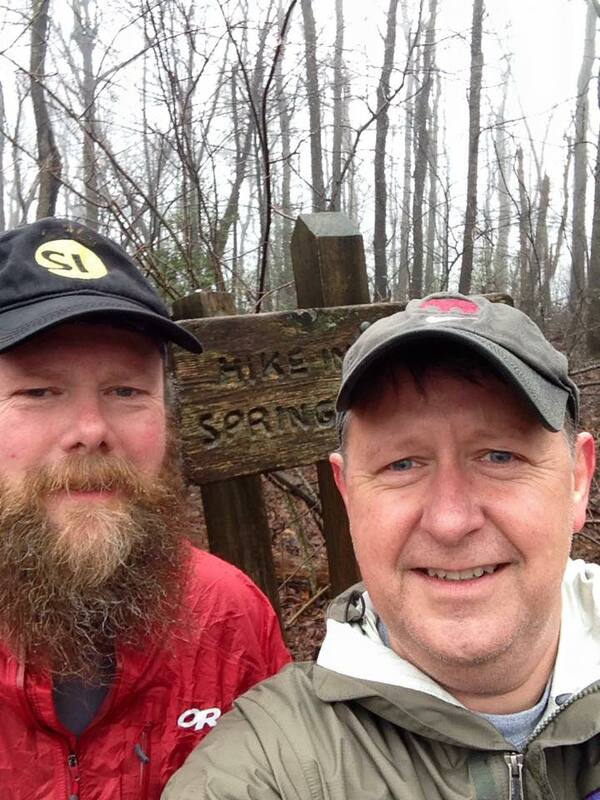 March 4th – My first day on the Appalachian Trail, pre-Springer non-counting miles. The most beautiful thing that I saw was an absolutely Tolkeinesque spot on the trail. I came around a corner and over a small rise to encounter a set of stone steps that were surrounded by bright green moss and ferns. Like a small piece of Middle Earth in the fog. It brought about an amazing feeling of satisfaction and calm. 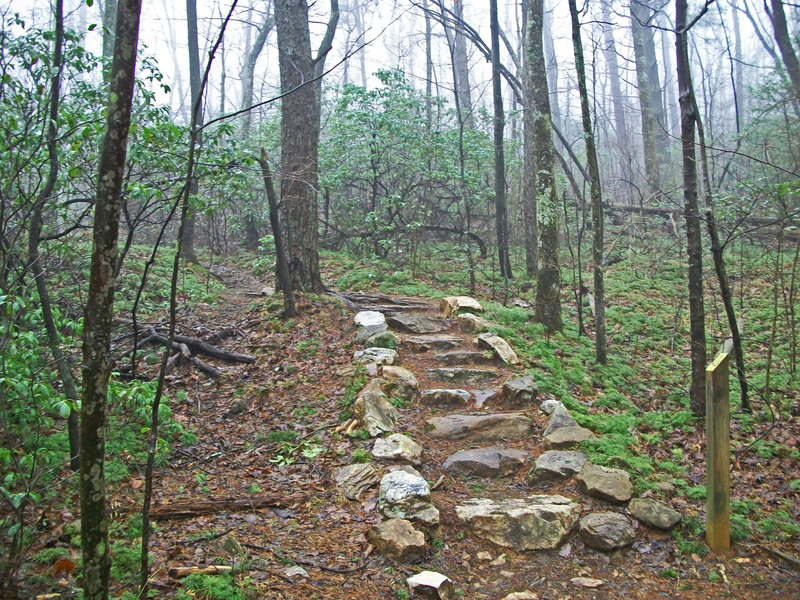 I learned that day that five miles on the Appalachian Trail with a forty plus pound pack is possible. What made me happy was just finally being on the trail, after months of preparation and thinking about it, after quitting my job, traveling across the country and making my way to Georgia I was finally doing it. 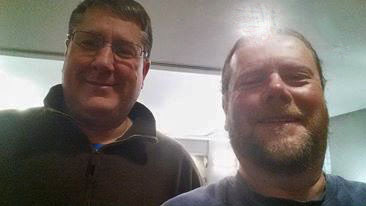 That and the presence of my good friend Jim Cooper who had met me at the Len Foote, Hike Inn and hiked me in on my first day. All in all a fantastic day! You’ll have to wait for my book to come out in a couple of months to see the rest of my journey but it was one of the most wonderful and amazing times of my life. I am really missing the trail this week, my trail family and the overall trail community. I’ve seen a lot of posts from trail folks saying the same thing. I wish the folks just heading out the best of weather, the best of luck and the best of times! How the world has changed a year later. So here we are in 2016 and fifteen months into my journey I’m looking for a job. I did a 1000 miles on the Appalachian Trail, photographed Polar Bears and watched the Northern Lights in the Arctic, Swam with Whale Sharks at the Georgia Aquarium and have finished the first draft of my AT book. Now I need to get back to work and I had my first interview this week. It was funny, on Monday, the day I interviewed, the temperature dropped in the desert, the wind came up, the clouds came in and I have to say it was almost the exact same weather I had that first day heading into the Hike Inn. I was homesick for the forest and feeling really great remembering those first few nervous days on the trail. 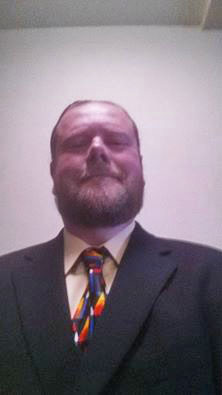 I smiled all day at my interview. 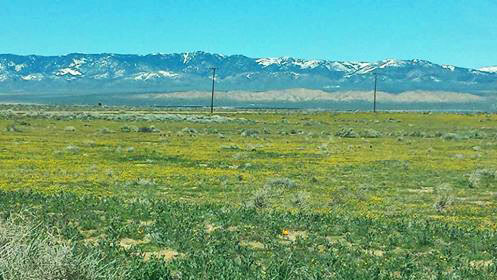 I would get a special treat on the way out of the desert, a rainy winter has turned the floor of the Mojave into a carpet of flowers and that night we’d gotten snow in the mountains. So as I drove through the desert, paralleling a piece of the Pacific Crest Trail, I took this photo with my phone. It was a good day of driving and if it wasn’t going to piss buckets in the valley and dump snow in the Sierras for the next 5 days, I would have found my way out onto a trail this weekend. Instead I’ll be content to keep editing the book and fondly remembering Georgia. This entry was posted in Appalachian Trail (AT) Happiness, personal happiness and tagged appalachian trail, AT, AT2016, backcountry, backpacking, friends, happiness, hiking, looking back, walking. Bookmark the permalink.